DC drilling rig vacuum degasser(ZCQ series) is a special-purpose device for the treatment of gas-cut drilling fluid. It is a new type one we have designed and developed by combining different sorts of degassers from home and abroad. Now DC Solid control company has 10 sets ZCQ240 and ZCQ270 vacuum degasser in stock to meet your urgently requirements. 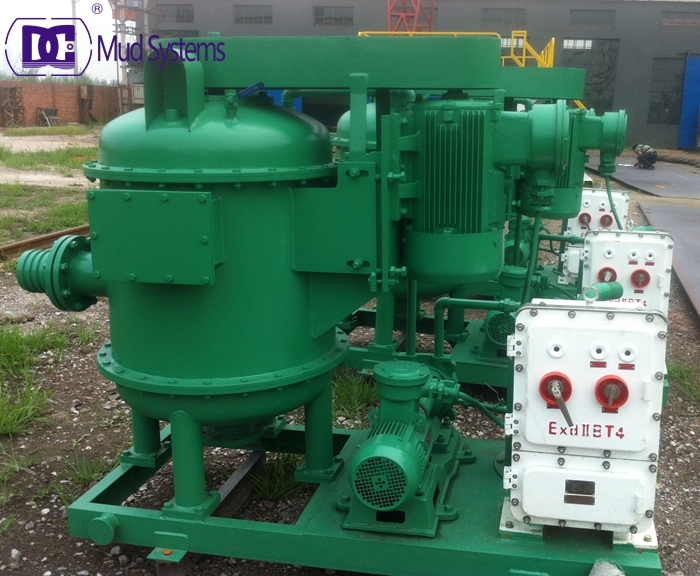 Vacuum degasser is one important part but not a phase of solids control, it is used to separate the gas and drilling fluids for safe and enviorment friendly. It is always installed after the shale shaker, and before the desander and desilter (or mud cleaner). DC Vacuum degasser produced by DC Machinery is suitable for various supporting of drilling mud solids control system, it plays an important role in restoring drilling mud performance, and can also be an agitator with big power. ZCQ Vacuum degasser also can act as a big agitator for the drilling mud, which helps the treatment for desander and desilter. Please contact me to get more infor about the vacuum degasser.